A little over a week ago, Jason Dufner won the 2013 PGA Championship, one of the four major events on the PGA Tour. Dufner is close to all of us here in Omaha who are associated with the Cox Classic presented by Lexus of Omaha, since he played here in 2001, 2002, 2003 & 2006 (his best finish being T8 in 2001). (Photo shown is Jason in 2006 at the Cox Classic courtesy of PGATour Images, 2006). I’ve been involved on the board of the Omaha Community Service Foundation (OCSF dba Cox Classic) since the spring of 2006. At my first event as a board member in 2006 I watched this new 2013 PGA Champion “struggle” to finish -11 and tied for 28th. But big things were in store for him! That’s the beauty of the Cox Classic, which is a PGA Tour event on the Web.com Tour. The Web.com Tour is the developmental tour and the pathway for players to get to the U.S.-based PGA Tour. At the end of the Web.com season, the top 25 players on the money list are given PGA Tour memberships (cards) for the next season. These 25 PGA Tour cards for the 2014 season will be handed out at a ceremony in Omaha immediately following the conclusion of the Cox Classic on Sunday, August 25th. Another 25 cards are awarded to the top finishers in a four tournament series of events involving players from both the Web. com Tour and the PGA Tour. One player who will receive a PGA Tour card on Sunday in Omaha is Tim Wilkinson. We had the pleasure of having Tim stay at our house during three tournaments from 2006 to 2008. He has had a great year on the Web.com Tour and irregardless of how he does at the Cox Classic, he will end up in the top 25 on the money list. I have followed him every week on the Web.com Tour over the past several years…and next year will get to follow him and watch him on the PGA Tour! So, you might not know many of the players on the Web.com Tour…now. But you will likely know many of them someday. Case in point is Jason Dufner and Tim Wilkinson and the dozens of other players on the PGA Tour who have come through Omaha. The Omaha event, the Cox Classic, is a gem of a tournament at any level. The Web.com players look forward to coming to Omaha because it gives them a feel for what the PGA Tour will be like. In fact, Omaha has more of a PGA Tour feel than many PGA Tour events! The Omaha event draws over 120,000 spectators, generates over $9 million of economic impact to the area, raises over $100,000 for local charities and is assisted by nearly 1,000 community volunteers. It’s an outstanding community event. This week Giving50x52 made a contribution. 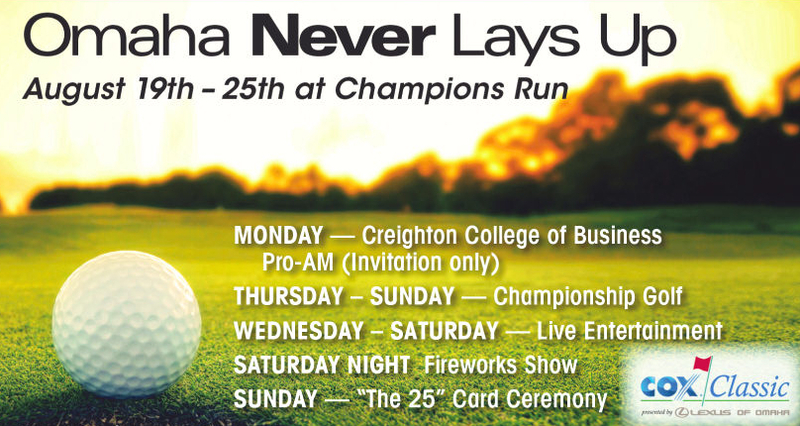 THIS WEEK, AUGUST 22-25, THE 18TH ANNUAL OMAHA TOURNAMENT WILL BE PLAYED AT CHAMPIONS RUN GOLF COURSE IN OMAHA. IF YOU ARE IN THE AREA, PLEASE COME OUT AND WATCH TOMORROW’S PGA CHAMPIONS! What the Omaha tournament will look like after this year is not perfectly clear. The event is in the last year of a contract with major sponsor Cox Communications and with the Champions Run golf course. Both have been outstanding partners for the event! One thing that is certain is that we plan to be back in 2014 with another Web.com Tour event. Omahans care about this event and its presentation, and we will do whatever it takes to host another quality event in 2014! On May 22nd, as part of the OmahaGives! 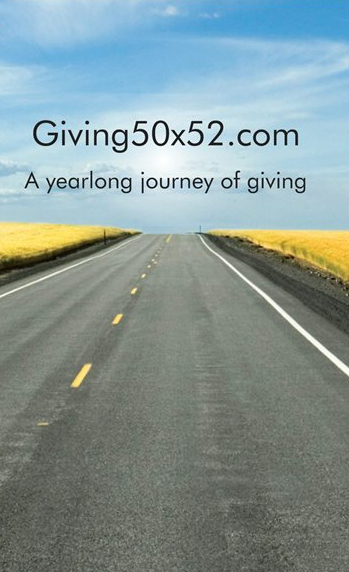 day, Giving50x52 gave $50 to Outward Bound Omaha. This organization is headed by my good friend Scott Hazelrigg, who worked hard to bring Outward Bound to Omaha. As background…in 2010, Outward Bound Omaha was created to bring high quality experiential education programs to Nebraska. Based on a curriculum that is focused on developing high quality leaders within the Omaha metro area, they serve students through school-based programs, one-day challenge course programs, and backcountry expeditions. In addition to youth programs, Outward Bound Omaha provides programs that focus on corporate teambuilding and educator training. Previously, I’ve been invited to participate in the Outward Bound Omaha Hitchcock High Ropes Challenge Course but could not attend, so when another invitation came this summer I made it a priority to participate on June 30th…and did it with my whole family. The first part of the session included several activities to get to know the others in our group. There were the four Conleys and ten others in this group. We then went to their Team Development Course and worked as a group to solve a couple problems that just may have saved the world! Well, at that point, I’m thinking this is pretty simple, “A…bring it on”. Yep, maybe I was a little over confident at that point. The next activities involved walking on a thin cable about 25 feet up in the air and having to cross over another cable in the middle. I can’t do justice to the level of “learning” and often “panic” that this caused. We were always tethered and safe, but that seemed to provide surprisingly little comfort. But in the end, it was a really fun and challenging way to spend a Sunday. I didn’t think I’d be challenged. I was. The activities creatively and firmly reinforced the importance of teamwork. I might still be up on that wire if it weren’t for the great help of my team. 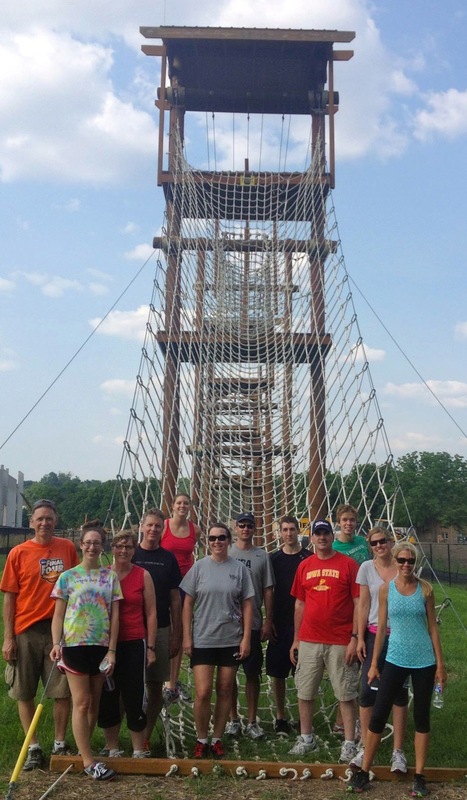 The website for Outward Bound Omaha says that by completing the Hitchcock High Ropes Challenge Course you might discover that there is more in you than you know. Very true. You also might find out that there is a great team around you and the importance of working together. Memorial Day marks the unofficial start of summer and quite often the official start of mosquito season. To most of us, mosquitoes are a nuisance and seasonal, but what if that season (mosquito) never ended, and was deadly? My favorite columnist is undoubtedly Rick Reilly. For years, I’ve looked forward to getting the weekly Sports Illustrated/ESPN Magazine and immediately turn to read his column…and I’ve read all of his books. One of his columns that I have never forgotten was from April 2006 titled, Nothing But Nets. Here is a link to that column. Rick Reilly’s column and his leadership led to the creation of the United Nations Foundation’s Nothing But Nets campaign. His efforts have inspired the largest global, grassroots campaign to fight malaria. It’s hard to imagine a better tag line for a person or columnist! Rick is nothing short of impressive to me as a writer and humanitarian! Malaria is one of the world’s most serious global health issues. More than 200 million people each year are infected, and more than 600,000 of those die, EACH YEAR. Malaria is particularly devastating in Africa where the disease is a leading cause of death among children. Every 60 seconds, a child in Africa dies from a malaria infection. Malaria is a disease transmitted by mosquitoes that bite at night. A long-lasting, insecticide-treated bed net creates a physical barrier against deadly malaria-carrying mosquitoes. The insecticide woven into the net kills mosquitoes, preventing them from biting their next victim. This reduces malaria across a community. Bed nets can reduce malaria transmission by 90 percent in areas with high bed net coverage rates. Thanks to bed nets and other tools, malaria deaths in Africa have dropped by one third in the past decade. Until today, I had offered up nothing but air balls on Rick’s effort. Since just $10 provides a net and saves a life, today Giving50x52 funded 5 nets in this mid-week effort. Week 39 (part 3) – OmahaGives! Back in Week 21 I blogged about #GivingTuesday and that I had missed that national day of giving held in November 2012. So, when I heard about OmahaGives24, I wasn’t going to miss Omaha’s new 24-hour, online giving event! Omaha Gives! was organized by the Omaha Community Foundation to grow philanthropy in the Omaha area. Matching funds of $500,000 and additional prize money will be made available to amplify charitable donations made on this day, which is TODAY, May 22, 2013. Nearly 300 organizations that are headquartered or provide services in the Omaha area are represented on omahagives24.org. At least 94% of every dollar will go to the nonprofit selected (there are about 6% in fees for credit card processing and online technology). Giving50x52 just gave $50 to Film Streams, Inc. 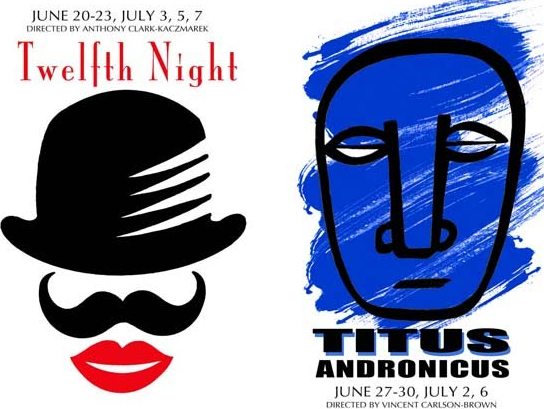 The mission of Film Streams is to enhance the cultural environment of the Omaha-Council Bluffs area through the presentation and discussion of film as an art form. So, Omaha, it’s a 24 hour party of giving…come join the party! Speaking of the Omaha Community Foundation, there was an excellent story in the Omaha World-Herald on Sunday, May 19th about the leadership transition at the organization. Sara Boyd, currently President and COO, will become CEO this summer. Sara is an outstanding leader and Omaha is fortunate to have her at the helm of this important organization. Finally, today is my significantly older brother Jeff’s birthday, so I wanted to wish him a happy birthday. If you round your age to the nearest decade, he is now in the 60 year old category! Happy birthday Jeff! 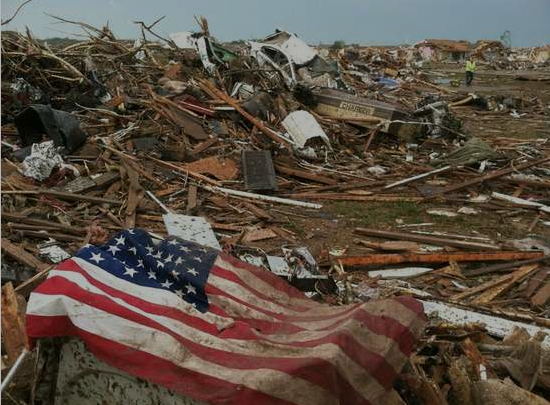 MOORE, OKLAHOMA – Thinking of our neighbors. The devastating May tornadoes have left most Oklahomans (and others) stunned and wondering what they could do to help. United Way of Central Oklahoma advises that monetary donations are the best way to assist. The organization has activated its disaster relief fund effective Monday, May 20, 2013, so individuals may contribute specifically to the May tornadoes relief and recovery efforts. Prithee gentlewomen and gentlemen, t’would be folly, on me yearlong journey o’ giving, to ignore the toils of a gang of local arts jackanapes. 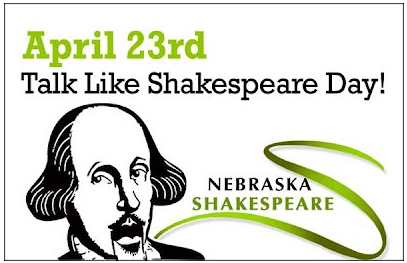 So, by my troth I give my soul, my blood, my heart, my life….ok, only $50…to Nebraska Shakespeare. Until seven days forth, fare thee well thou bootless rough-hewn haggards!